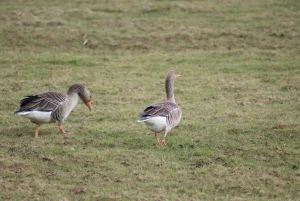 Observation - Grey Lag Goose - UK and Ireland. Description: Large bird (800mm), bulky body, greyish patterned (stripes) plumage, long neck, orange/pink beak and legs, white rump,orange ring around eye. Large bird (800mm), bulky body, greyish patterned (stripes) plumage, long neck, orange/pink beak and legs, white rump,orange ring around eye.